Hot pepper cheese, spinach, tomatoes, sour cream and garlic. Served with mucho tortilla chips. Fresh corn tortilla chips topped with green onions, shredded lettuce, black olives, diced tomatoes and jalapeños. Covered with melted monterey jack and cheddar cheeses. Served with guacamole and sour cream. Consult our chili selection for one of our award winning chilies as a nacho dip. Dusted with special cornmeal breading, flash fried and served with chipotle mayo and jalapeño tartar sauce. Egg rolls filled with black beans, spinach, chicken, corn, cilantro and monterey jack cheese. Served with a side of red ranch dip. Deep-fried strips of chicken breast served with Arkansas Bar-B-Que and honey mustard sauces. Fried and served with our own chipotle mayo dip. Eight hand-breaded shrimp, fried and tossed in our house buffalo sauce and served with creamy blue cheese dressing and celery sticks. Boneless or regular. Includes your choice of blue cheese or ranch dressing and served with celery sticks. A full pound of our famous “Drummies,” fried crispy then tossed in our sweet, spicy Thai Dragon sauce. A full pound of chicken drummies and wings. Served with Arkansas Bar-B-Que sauce. Crispy corn tortilla chips served with salsa. Crispy corn tortilla chips with melted cheddar and monterey jack cheese and served with salsa. Boar’s Head roasted red pepper hummus, toasted pita bread an assortment of veggies. Served with homemade chipotle peach ketchup. Coconut-fried chicken served over mixed greens with artichoke hearts, egg, tomato, avocado and shredded cheese. Topped with our stone ground honey-mustard dressing. A blend of Napa cabbage, grilled chicken, Thai peanut dressing, red pepper, mandarin oranges and carrot sticks. Topped with honey roasted peanuts and black sesame seeds. Made fresh with a mixture of lettuce, seasonal veggies and one of our homemade dressings. Seasoned grilled chicken breast, ham, bacon, shredded lettuce, tomato and cheese tossed in ranch dressing and wrapped in a tortilla. Served with kettle chips. Our grilled lemon pepper chicken, caesar salad, tomatoes and parmesan cheese rolled in a hot spinach tortilla. Served with fresh fruit, chips and salsa. Carrots, cucumber, tomato, red pepper, avocado, artichokes, red onion, broccoli and shredded lettuce combined in a spinach tortilla. Tossed with housemade avocado cream dressing and served with kettle chips. Lightly breaded diced chicken tenders tossed in Buffalo sauce mixed with diced tomato, celery, shredded lettuce, blue cheese crumbles and wrapped in a flour tortilla. Served with kettle chips and blue cheese dressing. Featured in Bon Appetit, our wild rice soup is our own unique blend of long-grain Minnesota wild rice and white rice mixed with chunks of chicken in a homemade stock with fresh vegetables and selected seasonings. We present a different soup each day, selected from our favorite recipes. Ask your server for today’s offering. 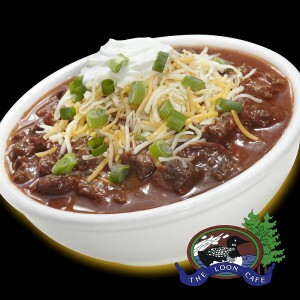 Once again, the local poll conducted by City Pages has selected our chilies number one in the Twin City area. Thanks readers! The first three chilies are topped with grated cheddar cheese, diced green onion and a dollop of sour cream. All meats are trimmed to eliminate fat. A green chili pork stew loaded with onions, chiles, tomatoes, lean hand-cut chunks of pork in a delicious spicy garlic sauce. As served at the LaTolteca Tortelleria in Azusa, California for over forty years. Thanks Tim & Ben! We top it with cheese, green onions and sour cream. Served with flour tortillas. A thick, rich, spicy blend of chicken, peppers, onions and green chiles served with jalapeño cream cheese, green onions and fresh warm tortillas. Lean ground turkey breast and white beans in a zesty, spicy garlic tomato sauce. Topped with queso fresco and green onions. Served with flour tortillas. All sandwiches served with kettle chips. Substitute french fries or fresh fruit for $1.00. Coated with habañero cracker-crumb breading, fried OR grilled and served on a sourdough bun, with roasted jalapeño tartar sauce, coleslaw and chips. A breaded fried chicken breast dipped in our “Hot Wing Sauce” and topped with Huntsman cheese and shredded lettuce on a fresh onion roll. Served with a side of blue cheese or ranch dressing. Slow-smoked on hickory and cherry woods for 14 hours. Steamed for extra tenderness, thin sliced and topped with hot pepper cheese, lettuce and tomato. Served on pumpernickel bread with a mound of coleslaw and a side of spicy mustard. Served with kettle chips. 100% Lean ground turkey. Seasoned with diced green chiles, onions, jalapenos, lime juice, and ranch seasoning. Served on an onion bun with hot pepper cheese, shredded lettuce, tomato, and a side of homemade guacamole. Served with hot pepper cheese, lettuce, tomato, onion and salsa on an onion bun. Thinly sliced corned beef OR turkey grilled with our spicy kraut mix. Served between two slices of marbled rye with Swiss and hot pepper cheeses. Thousand Island dressing on the side. Sliced prime rib grilled with a mix of peppers and onions, then covered with melted mozzarella and hot pepper cheese on a Black Russian Rye bun with a side of horseradish sauce. Seasoned with Cajun OR Jamaican jerk spices and topped with shredded lettuce. Served on a toasted onion bun with a side of our Arkansas Bar-B-Que sauce. Lean, hand-shredded pork slow simmered in our own hot spicy barbecue sauce. Served on a grilled onion bun and topped with shredded cabbage and green onions. Served with our tangy coleslaw. Ample slices of breast of turkey on multi-grain bread with mayo, onion, lettuce, tomato and jazzed up with honey creole mustard. Habañero breaded walleye, fried and mixed with shredded cabbage, lime-chipotle sour cream and served with pineapple-mango salsa, regular salsa and tortilla chips. 6 oz. center cut sirloin, grilled and served open-faced on toast with grilled onions. Accompanied by your choice of fries or fresh fruit. Try it blackened with cajun spices. A Minnesota favorite! Coated with habañero cracker-crumb breading, fried OR grilled and served with roasted jalapeño tartar sauce, coleslaw and fries or fresh fruit. Seasoned strips of chicken mixed with red, yellow and green peppers stuffed in a crisp jumbo burrito and smothered in our zesty chicken chili. Topped with jalapeño cream cheese and green onions. Served with black beans and Spanish rice. Marinated chicken grilled with sweet peppers and onions. Served with four warm flour tortillas, lettuce, tomatoes, black olives, green onions, jalapeño cream cheese, salsa, black beans and Spanish rice. Twin tacos wrapped with a soft flour tortilla around a hard corn tortilla with guacamole between the two and filled with seasoned chicken, shredded lettuce, diced tomatoes, shredded cheese, black olives and green onions. Served with spicy salsa, black beans and Spanish rice. Spicy chicken, onions and peppers rolled in corn tortillas and covered with enchilada red sauce and shredded cheese. Baked & served with our black beans and Spanish rice. All rib and brisket orders include coleslaw, bourbon baked beans and fries. All of our Bar-B-Que items are slow-smoked in our Southern Pride™ smoker with real hickory or cherry wood, giving them a truly distinct flavor. Get The Loon To Go; All of our Bar-B-Que menu items are available for takeout and catering. Ribs are hand-rubbed with our special, spicy seasonings. Slow-smoked on hickory logs for 6 hours finished on our char-grill and lightly sauced with award-winning Pickled Parr BBQ Sauce. Whole beef brisket specially marinated and seasoned then smoked for 14 hours on hickory wood. Trimmed lean then hand-sliced. Served on an onion bun accompanied by coleslaw, bourbon baked beans, bbq sauce and fries. Try our spicy beef jerky. Available by the slice, $4.25; 1⁄2 pound, $16; or pound, $29. Ask your server about our daily special. Layers of vanilla ice cream, hot fudge, pecans and smashed Butterfinger candy bars. Topped with whipped cream. Butterscotch filling with Jack Daniel’s, poured over chocolate chips and crunchy pecans. Topped with fresh whipped cream. Two farm fresh eggs, any style, three slices of bacon or two pork sausage links, hash browns and your choice of toast. Two fried eggs topped with American cheese & crispy bacon served on multi-grain toast with hash browns and fresh fruit. Quality corned beef brisket mixed with potatoes, onions and spices then grilled and topped with two poached eggs, served with fresh fruit and your choice of toast. Jalapeño corn-bread smothered with our green chili dirty pork stew, topped with two eggs any style and cheddar-jack cheese. Served with fresh fruit. Two think slices of King’s Hawaiian bread dunked in egg custard and rolled in smashed cornflakes. Grilled and served with whipped butter and maple syrup. Toasted English muffins topped with smoked pitt ham, poached egg and our creamy habanero sauce, served with hash browns or fresh fruit. Scrambled eggs, diced onions & peppers, tomatoes, shredded cheese rolled in a flour tortilla. Served with a side of chicken chili and hash browns. A 6oz. center cut sirloin cooked to order, two eggs any style, toast, fresh fruit or hash browns. Griddled and served with whipped butter and maple syrup. For the young at heart. Includes a pancake, bacon, scrambled eggs and fresh fruit. Mini Corn Dogs served with fries or fruit. Served with Honey Mustard & with your choice of fries or fruit. With American cheese & served with fries or fruit. Made fresh with a mixture of lettuce, seasonal veggies and one of our homemade dressings: French, Fat free ranch or Balsamic. Made fresh with mixed greens, carrots, tomato and cucumber. All of our menu items are available for takeout and catering. For information and menu selection please call The Loon Cafe at 612-332-8342 and ask to speak with Tim or Cecelia.